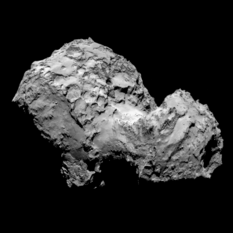 After a journey of more than a decade, Rosetta has finally arrived at comet 67P Churyumov-Gerasimenko. Confirmation of the successful rocket firing came at about 9:30 UTC via a webcast from ESA's Operations Centre in Darmstadt, Germany. 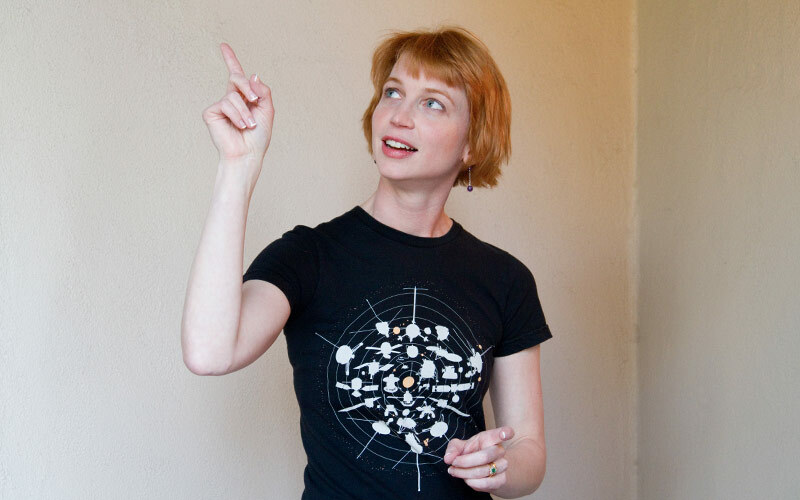 Today's the day Rosetta arrives at a comet! 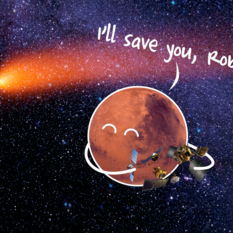 In less than a day, Rosetta will officially arrive, becoming the first spacecraft ever to orbit a comet! 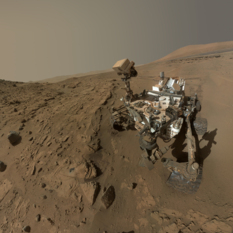 Watch an ESA Livestream of the arrival, and check out the latest photos. 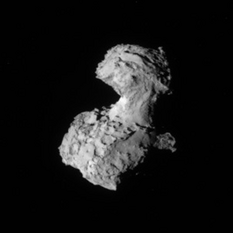 It's just two days now until Rosetta arrives in its initial 100-kilometer "orbit" of comet Churyumov-Gerasimenko, and the latest view from Rosetta's NavCam is fascinating. 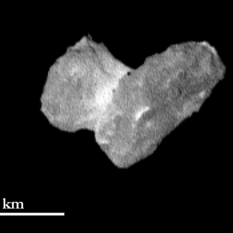 Circular features on the comet remind me of Tempel 1 as seen by Deep Impact and Stardust. 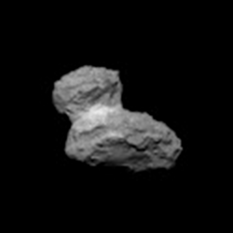 A shift in position has brought shadows into view from Rosetta, outlining scarps and ridges on Churyumov-Gerasimenko. 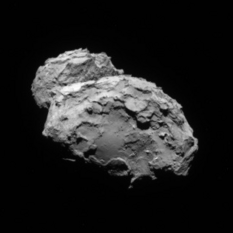 Rosetta's view of the comet is getting better and better. Today they released a new image from the high-resolution OSIRIS camera, and it's a very fresh one, taken only two days ago. Distinct features are coming into view. And it's finally detailed enough for me to compare it to the five other comets we've visited in the past. A journey of nearly a decade is almost over. 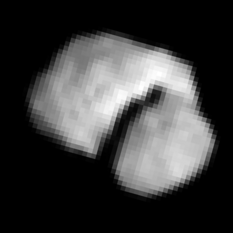 Rosetta is making its final approach to comet 67P/Churyumov-Gerasimenko, and the comet's strange shape is beginning to come into focus. 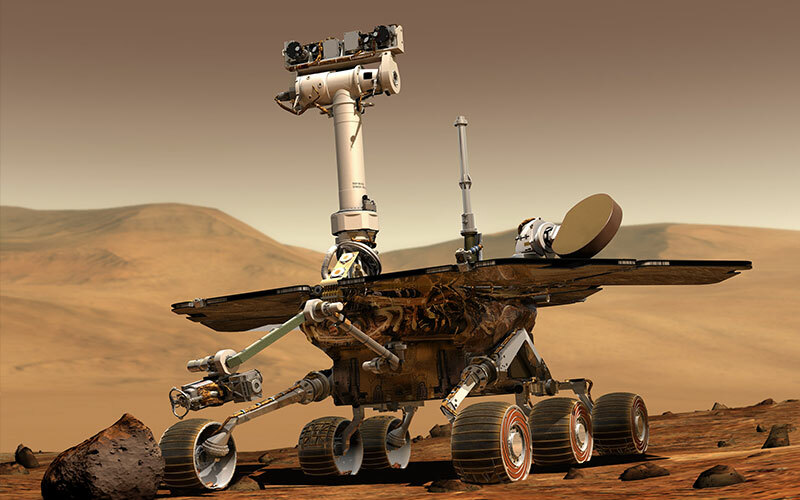 As of today, the spacecraft is only 2000 kilometers away from the comet, and 8 days away from arrival. 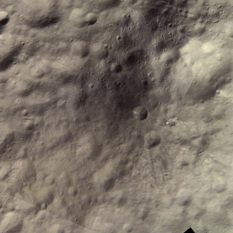 Newly processed images of one of the more puzzling features on the surface of Vesta: a dark mountain named Aricia Tholus.